Home » Viral Posts » What is the story behind this picture? What is the story behind this picture? When photographer Avinash Lodhi came across a group of monkeys in Jabalphur, India, he decided to take a seat on the ground and observe what they were doing.He also wanted to snap some photos in the hopes of obtaining a few great shots, but he probably had no idea that he'd capture a seriously powerful picture of what appears to be a mother monkey holding her collapsed baby. "It was so quick I didn't even know what was happening when I took the picture but as soon as I confirmed the image I was silent for an hour,” he said. "This moment is rare, especially with animals. 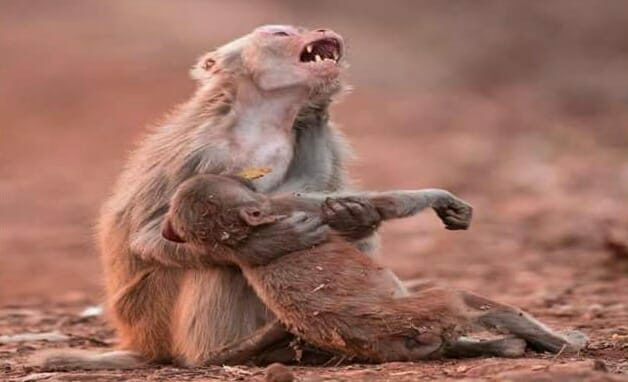 "While this looks like a heartbroken mother wailing and clutching her dead offspring, Lodhi says the baby had just tripped and fallen, then got up quickly after the photo was taken. It's definitely possible that the monkey may have felt worry, but we should also remember not to anthropomorphize animal behavior too much because it isn't always what it appears to be. Either way, be sure to share this photo if seeing it hit you right in the feels.